Individual Rank Lists are available for each subject of JAM 2014. Candidates who passed the exam will get the Score card for each subject on registered post. The score card gives the All India Rank obtained by the candidate on JAM 2014 and the marks scored in the respective Subject. 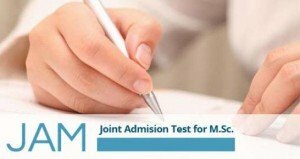 JAM 2014 scores are considered for admissions to M.Sc, M.Sc - PhD, M.Sc - M.Tech, integrated PhD and other post graduate programmes at the IIS Bangalore and at the IITs all over india. The admission process to the post graduate programmes will begin from April 17 and will continue till April 30. Candidates who qualified JAM 2014 can apply for desired programme(s) through IIT Kanpur. Although the eligibility criteria will be decided by the institute concerned, candidates can apply for any number of courses through the single application form available at the IIT Kanpur website. Eligibility is applicable to those candidates who have done a Bachelor’s degree in relevant discipline with 55% aggregate and 50% for SC/ST’s from a recognized Indian institution/university. Eligible foreign nationals can also appear for JAM. IIT JAM examination. This year IIT JAM examination 2014 was conducted on 9th February 2014 by IIT JAM Result 2014. The results are declared now. For the academic year 2014-2015, IISER PUNE will admit students in their integrated Ph.D Programs in Chemical and Physical Sciences through JAM 2014. *Applications will not be given in Banks this time . *Applications will be accepted only in the Online Mode. *CA and GP tests have been discontinued. Candidates are required to check IIT JAM Result 2014 in the official website www.gate.iitb.ac.in.